Two MBC members – Mark and Louise Collier – live in Burkina Faso, West Africa. 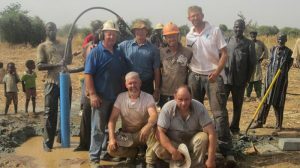 They drill water wells in needy villages and support the work of local pastors and missionaries. Friends in Action International is an evangelical non-profit mission organisation. Our team serves missionaries around the world and the people that they serve by demonstrating God’s love and provision in practical ways such as drilling water wells, building bridges and medical clinics, supplying medical equipment and supplies etc. We also train up locals to give them useful skills to generate financial income for their families and to help assist on-going work. Alongside this, we send work teams from the USA, Canada, and the United Kingdom to come alongside missionaries and local organisations.